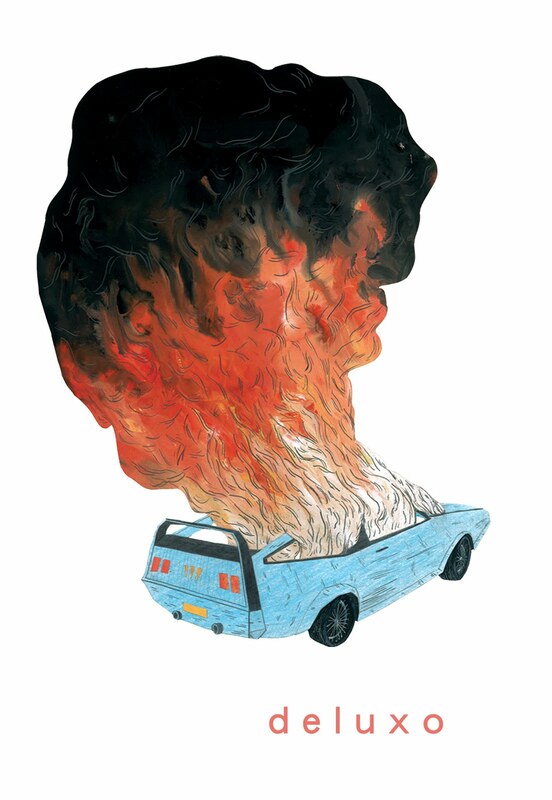 I came up with this image of a burning car* for a video game cover design. It is for Grand Theft Auto: Vice City. I remember playing this game and driving the cars around and shooting guns though I can't remember anything about the story. In a lot of ways I like the way cars look like when they are on fire. It always seems like its an arresting image in that when you watch a car on fire you inevitably seem to await its explosion. Christian the librarian gave me a printout of a car on fire which was inspiring in an unexpected way. *one of the cars you can steal in the game is this, a blue "deluxo". A month ago I had this urge to make a spot image of a car on fire - I did several sketches of it and kept failing and eventually moved on to something else. Now that I'm seeing this drawing, I'm so glad I didn't bother to finish - this is just so much more interesting than what I was coming up with. I love this! Your drawings are inspiring. wow, these are nice ones, the comments. Thank you for that! I'm glad to hear that we're on the same page niv! wow. the color choices. the blue to the smokey pastel to the red turning vibrant and aggressive, and the black...who in the world did you make the black work on top? the composition is great too. mary! where are you??? Mallory and I miss you, did we ever ask you to join our soccer team?